Speaking of comments... I had a few this week that made me laugh out loud. LITERALLY. These were the parts of their comments that I found flattering... but humorous just the same. ... your pictures look like they are straight out of a Pottery Barn catalog! Good Job! I thought I could just take these comments sitting down... but I-just-cant! We have 2 of these WAY too big chairs, that my parents were going to give to their local thrift store, when I rescued them from the donation heap. We had NOTHING to sit on... and had to sell our couch, to earn money to move BACK after we lived in AZ... so in to my house... these "beasts" came. They are SO SO SO beat up, stained and ugly. They are wearing super thin, and have had about EVERYTHING in our house either splattered, spilled, or dropped on them. I hate that these guys are the FIRST thing that people see when they come in my house... but I AM glad that we have SOMETHING for people to sit on, even if they are kinda "oogly"
Even my "cute" spaces... look "Ugly" most days. So don't fool yourself... into thinking that just because I have a clean picture on my blog sidebar, means that it looks like that all... or even 50% of the time. Wish it was... but it's SO Not True. And I don't even want to TALK about the basement. It's our toy GRAVEYARD and kid haven. I just let my kids trash this space everyday, while I try to get work done... and then clean it up at the end of the day. HELLO, GAPING HOLE IN THE WALL!!! It's been about 2 years... think we might want to get around to making some kind of cupboard or door for this massive water shut off, in the MIDDLE of our basement living room???? and the AWESOME paint job, in our back room. The "great, PB looking" pictures that I take for my blog, are not ONLY for your viewing pleasure, but for MY OWN, as well. lol. ... that occasionally is my life. I'm off to clean something up...I feel my OCD's and insecurities kicking in. I do feel better after reading this! but I am also totally inspired just about every time you make something! Thanks for sharing this. Now I feel normal. Another reason I love ya! Thanks for keeping it real! PS I have my neighbor convinced that I have a "picture perfect" house because I keep the living room cleaned at all times just in case someone drops by. She's never looked down the hall! Ha! Thanks for indulging us with your "not so clean" pics. I love you for sharing the pictures! 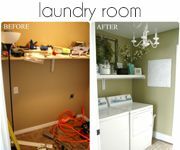 My basement and laundry room look exactly the same! My husband always says that the basement could be cleaned up with a snow shovel - that would pick up the toys easily! Thanks for keeping it real girl! I love that! I'm off to join you in the cleaning/organizing adventure! I am sitting her laughing hysterically and my daughter comes running over to see why! I love your honesty because since I've had my cast on my house is a sty! I can't imagine the people who live in complete cleanliness and organization. They sure wouldn't be my friend, lol! Maybe that's why I love you so much! Your post made me smile! Our homes have a lot in common!! hahhaah...we all have these things. You should see my list of "fix it" things. Thanks for sharing...now I know I am not the only one. 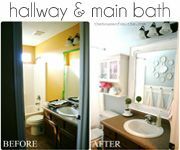 Thank you, thank you, thank you for posting this which is one of the most "real" posts I've ever seen and it makes me feel not so bad about my never ending list of projects and never cleaned/decorated/picture perfect house. Great post! I, too, feel better! I guess most of us live this way...it's just life happening! I loved your blog before. All that pretty stuff made me want to try harder. Now I LOVE your blog even more. It makes me feel better about my oh, so cluttered, messy life! Maybe I should snap a few pictures when I FINALLY get a room clean, to help me remember what my house can look like! Thanks for the laugh! whew! Glad to know I'm not completely dropping the ball! And those chairs aren't that bad! I still would kill to have your house! I love that you are keeping it real! that is beyond AWESOME! I can't tell you how much I am laughing. you are beyond creative and real! great combo! oh my gosh... i am normal!!! I love your BLOG!!! Hee hee! Thanks for keeping it real! I'm glad I'm not the only one who takes pictures of my clean house and relishes in them the rest of the time while my pad is a disaster! Thanks for sharing that with us...it's so honest and real! This is your BEST post yet! I am so relieved to know that even the most beautiful of houses can look ugly sometimes (and I mean that in a nice way). One thing at a time, right? Haha, now THIS post made me laugh out loud!!! Love it!! Now I'm off to celebrate the fact that I am normal. I have been sitting on a Best of My Basement series idea to showcase the things I find there and put to use (my husband has a crazy amount of things from his late grandfather, so it's really like a flea market in our house!). BUT, it would mean showing photos of what a disasterious catch-all it really is... You've just inspired me, though, to do it! Way to keep it real! you should cover up your hole in the wall with an old door, that would be so cute! Yep, no laundry in the PB catalog! Could it be that is why we all covet the rooms in their pages so much? Still, I love your style and the pretty pictures. Thanks for sharing the not-so-pretty, too! Ya, but you are one of the cleanest people I know. Balance, balance. That is what I keep telling my self. Pile in my kitchen gone CHECK. Paint drawers..... NEXT. Ha! I am glad I am not the only one that probably spruces up the area when I am taking a picture. Making the kids throw everything out of the cameras range! I am glad that you are realistic about your life, it makes it so much more fun to read your blog! LOL!! This is why you are my favorite! You are REAL!!!! Your house looks like people live in it. I am sooo happy to see someone else has some ugly painting. I have been following your blog for a while. I love everything you do. You have such amazing style. Thank you for posting this and reminding me that it doesn't always have to look perfect. I think you are amazing. Keep up the god work. Thank you. I am SO glad you have a house like that too..however it still looks so darn nice! But makes me feel better about the rooms I have finished, thare trashed 70% of the time a well. I Love you and your honesty!! Thank you so much for keeping it REAL!! You're awesome and I LOVE all that you share - EVERY SINGLE BIT OF IT!!!! awesome picts!! I will second (or third) the thought about an old door propped up in front of the monster hole in your basement wall! You know, spay it with some flat white paint and stress it a little....I am sure you could come up with some cute way to dress it up!!! lol!!! totally had this type of post ready to do also!! 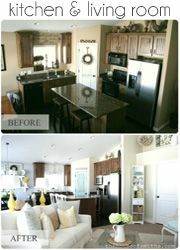 love it...but funny how your house still looks 10x cleaner than mine...ahhh! i feel so bad when my girlfriends come over and excpect to see this fully put together house...lol..nope!! i keep dirty dishes in the sink just to keep things real around here...not because i'm tryin to avoid them or anything...lol. YES...you are not OCD all the time!! lol..thanks for making me laugh out loud! :) One more reason that I love ya!! If its not too much to ask, I just started a natural beauty & health blog and I'm trying to gain some popularity. If you wouldn't mind taking a peek, that would be great! http://yourworkistodiscoveryourworld.blogspot.com/ THANKS! check u out keeping it realz. i luv it! It is always good to see the real life pictures. Now we know you are just like us and not some super woman. I still think you are quite the super woman!!! Thanks for sharing your reality with all of us and for taking the time to post the tutorials and inspiration to help us all have PB spaces! I am glad your house looks lived in too. I am always saying to company "Don't mind my mess". And yes, you will find me frantically wiping down counters, picking up odds and ends and straightening pillows as they are walking in. I feel much better knowing that a laundry room can have laundry in it and not just be something pretty to look at. Ha ha!! You really know how to keep it real!! When the time comes to donate those "ugly" chairs let me know okay!! I'd much rather pay you than fight with someone and then get the ol' stink eye at DI!! Your posts always make me laugh and inspire me, too. 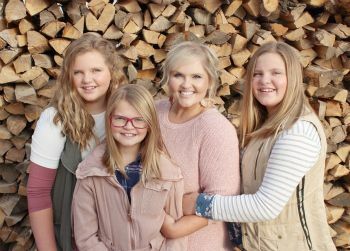 With three little girls, I'm amazed at all the things you manage to do! I LOVE your house and your style! I love that not only is your house "lived in" but you post pictures!! As I cruise through blogland I know there's no way people can keep their house spotless & have so many projects going, but it's nice to reminded. Thanks! Shelley I love you!!!! You crack me up!!!! You have a beautiful home and a beautiful family. You are too much! You just made me like you more than I already like you. (Is that weird that we are good friends and you don't know that yet?) Thanks for letting us see the real side. I think I'll go relax and let my kids dump fruit punch on the carpet now. I think this may be my first time commenting, but I love your blog. And I love how REAL you are. You don't put on a front, you're letting us into your home and saying "this is how a family lives". And it's true, thank you. Thanks for being so real and honest and creative! You are my hero. Thanks for making me enot so bad about the current state of my own home, and thanks for the fabulous inspiration you bring everyday! Thank you for sharing these pictures! You are too funny!! I am seriously appalled that you have laundry on the floor of your laundry room!Just Kidding! I'm really just so thrilled to find out that you really are human like the rest of us. Ok. I LOVE LOVE LOVED this post!! In the bloggin world, most people do not show the ugly. WHy focus on the bad the ugly anyways? Thats why so many of us love blogging and probably stay away from bloggers that complain alot. This post was great though because , it is true, your posts look flawless. Your home looks adorable through the pics. 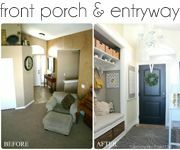 We all know every mommy out there has her ugly spaces, closets projects to be worked on. But its hard to remember that and first thoughts could easily be how we wish our home was as cute as so and so's. This was great to share with us. Thank you. It made me laugh at my messes this morning and didn't feel so stressed about them. Thank you Shelley! Okay, this is one of the many reasons I LOVE you. You are so REAL. Thank you for this awesome post that makes us all know that we are 'normal' in having messy parts of our houses!!!! Sometimes, when I am about to blog and am arranging everything perfectly for a photo, I wonder, "Am I a big fraud?!" because in the next room, there is a giant mess! I just have to tell you how much I truly love you right now! Never met you, stalk your blog, and think we would be best friends! Thanks for the amazing blog! Ok, I've never commented on your blog..but I do love it! But I just had to tell you thanks for posting this. It totally made me laugh and it made me feel a little better as I sit in the pile of toys and laundry and type my own blog. You're a brave soul and I respect that. Thanks for the laugh! So great to see Real Life in action. Gotta love those girls though. I have two boys that love to do the same thing, but it usally involves dirt - but we like to keep it outside. Thank you!!! It is so nice to see "real" homes. You are incredibly talented and inspire me so much, but it is reassuring to see that you have a "normal" life. Ok, I love your blog! I just found it somehow and I am currently wanting to do the hanging flower balls. Those balls are expensive! Even with a 40% off coupon! Anyway, love this post! And I feel the same way! And it is impossible to have a clean house with kids...and I have four! Thanks for being Real with us, I feel better now. ...Maybe when the kids are all in school??? I just found your blog and i'm looking at everything thinking man my life stinks and then I got to this post...thank you so much! I'm glad to know that your house doesn't always look perfect...even though I will still take it all...even on the not so good days!!! i love that you posted this. it's so refreshing! OK ..my Coffee just came out of my nose! (sorry, oversharing I know) you are C R A C K I N me up! Okay, I have been stalking your Blog after a girlfriend I know from High School sent me the link to your Blog on Facebook. And I kept coming back jealous, wondering how you keep your house so spotless and looking like a decorating magazine! It would leave me feeling guilty for spending time on your Blog when there were dishes to do or laundry to tend to. THANK YOU for posting that! Bwahahhaaa!!! LOVE the reality of this post and the fearlessness to post it!! I'm afraid this is what my house looks like ALL the time. New year today and new beginnings - been pinning like a crazy woman so that I can utilize other women's fab ideas for organizing & cleaning. Speaking of, I think I need to go see what storage I have and how I can use it.... Away I go!